Use this report to compare how your sales team performs against your competitors. The report displays opportunities that have competitors associated, with information on open, closed, won, and lost opportunities. The report displays only opportunities that have competitors associated that you have permission to see, in the country/region and time period that you specify. Get a quick view of all the activities associated with opportunities such as phone calls, tasks, emails, appointments, and closed opportunities. Use the information in this report to look at the details of each activity and identify patterns to make improvements in how you work to turn opportunities into leads, and leads into closed deals. When you run the report, choose Show All to get a detail view of all the activity. Activities can be grouped by owner or activity type, or by the record the activity is associated to. The information in this report helps you see how your sales team is performing against their sales goals. This report displays a chart of your target goals and your actual goals. 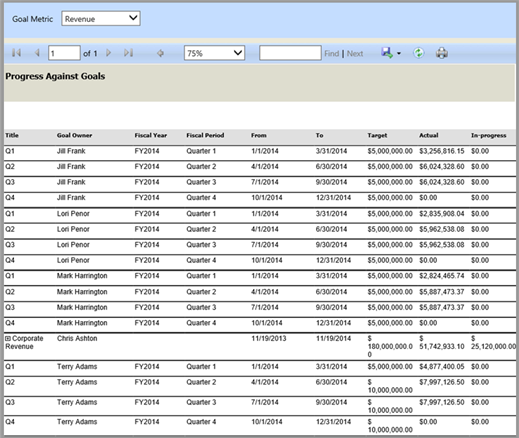 The report is generated from data that is rolled up to the goals at a set time. If the data is not up-to-date, then wait until the next time the data is rolled up. For more information, contact your Dynamics 365 for Customer Engagement appsadmin. 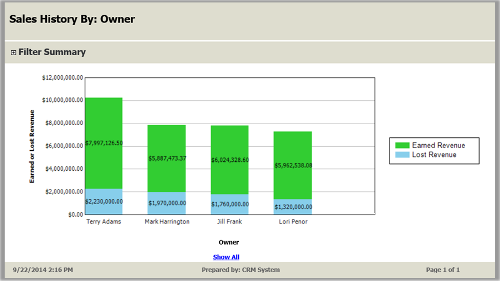 Use this report to see how your sales reps have performed and how much revenue they have generated for your business. See which sales reps closed the most sales – so you can award them for their great work. And also see which opportunities were lost so you can help your sales team do better next time. The report uses data from closed opportunities that were either won or lost and then calculates earned and lost revenue. Use the information in this report to forecast future revenue and set goals for your sales team. 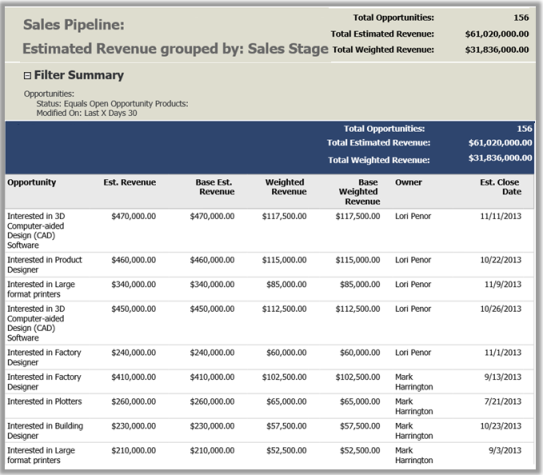 of potential sales grouped by user, sales territory, customer territory, date, products, rating, or sales stage. 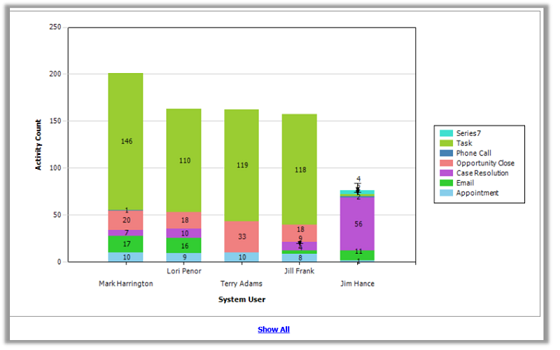 When you run the report, on the chart, click Show All to get a detail view of the report. Find out which type of lead is most beneficial in helping you grow your business. This report helps you compare how effective your lead sources are at generating quality opportunities. Keep your sales teams on the alert for possible business opportunities. Use this report to have your sales team follow-up on leads that they haven’t contacted in a while. When you run the report, specify the number of days that leads have been neglected. 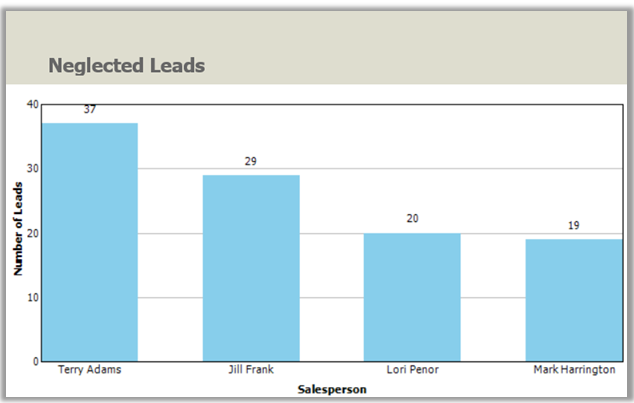 The report displays a chart of active leads that have had no activities or notes. Click Show All to drill down into the report.